The Island Poetographer VivaVoce: Knocked for six - and A Glorious Ladysmith Beach Day! Knocked for six - and A Glorious Ladysmith Beach Day! On June 21/14, we had a serious 'prang' with our beloved Honda and though Mr Bear was not seriously injured, I of course got whiplashed and dashboard knees and our Honda was a write off! So I have been busy dealing with the paperwork that the Insurance companies demand, along with trying to get remedial treatment from the chiro, the massage guy and the TPI man. Note: Never have a motor accident in the summer, all your friendly remedial people are on holidays or shortstaffed! 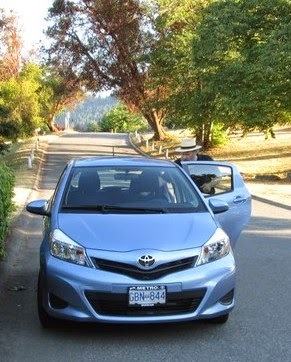 We now have new wheels: here she is, a 2014 Yaris LE Toyota at one of our very rare ' I just HAVE to get out of the house or I will go crazy' Beach Days. Luckily for us, a beachy park is less than an hour away and we spent a glorious day. Mr Bear read and I sketched away and once in a while we munched on fresh hot french fries from the concession stand, while the seagulls flew overhead, the boats sailed in the harbour and the kids chased each other around in the water park! Blessings of a Beachy Day no matter where you be.